Ski in winter or golf in summer from this condo w/ shared pools, hot tub & more! Draw up those plans for that next exciting skication in Mammoth at this cozy condo featuring plenty of on-site amenities including year-round spas, saunas, and a weight room, as well as summertime swimming pools, hot tubs, tennis courts, and even a horseshoe pit. This single-bedroom rental is just 350 yards from the Eagle Lodge offering a cafe and lift access right up the mountain. Or take a short stroll down to the nearby shuttle stop and head into downtown Mammoth Lakes via the Green Line for shopping, dining, and entertainment. The living room, with its plush sofabed, leather recliner, and old-school rocker, is the perfect place to kick back and relax in after an exciting day out on the slopes. Warm yourself by the wood-burning stove or step through the sliding glass doors and out onto your private deck. Alongside this area, there's a dining table with seating for four, a breakfast bar with two counter stools, and a well-equipped, full kitchen. Prepare anything from a late night snack to a full-course meal in this kitchen. The drawers and cabinets are stocked with essential cookware and dinnerware and there are plenty of countertop gadgets and appliances including a range, refrigerator, microwave oven, toaster, blender, and coffee maker. There's even a dishwasher to help you keep things nice and tidy during your stay. Don't forget to warm up by the fireplace before going to bed! The bedroom has a comfortable queen-size bed and convenient in-room sink. Directly across the hall, there's a full bath with a tub/shower combo. With one bedroom and a sofabed in the living room, this home sleeps up to four guests quite comfortably. WiFi is provided and there are two flatscreen cable TVs included to ensure you won't miss a moment of your favorite shows. The TV in the living room also includes a five-disc DVD player and home theater system to let you program your own movie nights (but don't forget the popcorn)! Keep your clothes fresh and clean during your stay thanks to the on-site laundry facilities and when you're not out skiing, snowboarding, or hiking, stick close to home and enjoy the many deluxe amenities including summertime swimming pools, hot tubs, a weight room, tennis and badminton courts, a horseshoe pit, and community BBQs in case you get inspired to have a cookout! When things warm up a bit, bring your clubs and challenge the 18 championship holes of the Sierra Star Golf Course located directly across the street from your condo, or head out on the many hiking and biking trails that crisscross the region. And for high-end shops and delicious dining, head a mile-and-a-half north to visit the Village at Mammoth. 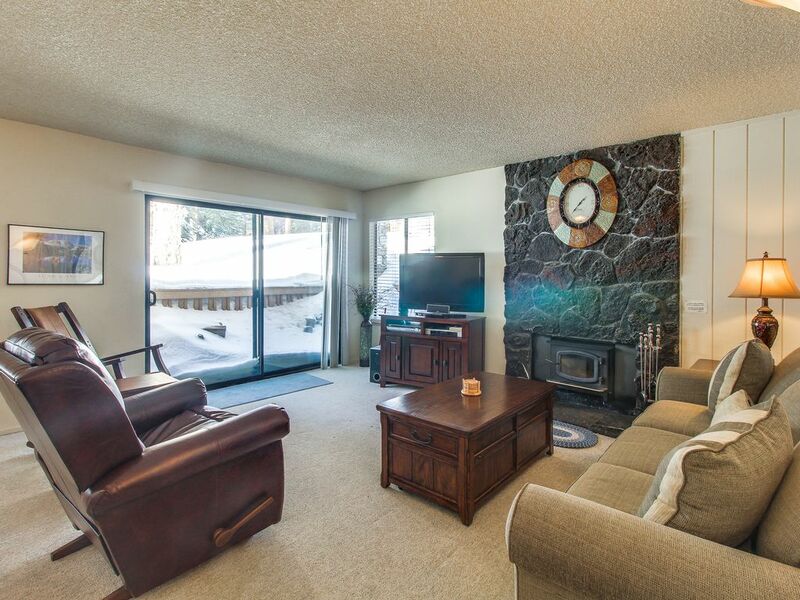 There's plenty of fun and adventure to be had from this cozy condo near the slopes at Mammoth. Make a reservation today! Parking Notes: Underground parking for one car is available ON THE LEFT HAND SIDE RIGHT AFTER THE THE ANSEL ADAMS BUILDING on Meridian Blv. in an assigned space with 7' clearance. One additional vehicle may park in the overflow parking near the office (first come, first served). Trailers are not allowed at this unit. Bring additional vehicles at own risk!!! Ski Shuttle Details: Just a short walk or free bus ride to Eagle Lodge/Chair 15. Quaint location, nice to have a wood stove. Close to Eagle lodge. It is not 350 yards from door to door of Eagle lodge. No pillow cases for the spare pillows, 1 small set of shampoo/conditioner ( we were here for 4 nights), no keys for the Sauna and hot tub, black sludge in oven, black hair on bathroom walls( we are blond) garbage under sofa( that was the second bed), Dvd player is not hooked up so no idea if it works, Tv remotes(3 of them) generally didn't work unless you were standing within a couple of feet, The pots and pans in the kitchen have either been abused by the last couple of guests or they have been in use too long as the teflon is scraped and coming up on all of them which is not very healthy to cook on, The clock above the fireplace doesn't tell time, the fireplace directions are not quite right and with wet wood couldn't use it anyways. At least the heat worked but the running toilet every 20-40 minutes killed our sleep. It had salt and pepper in the cupboards and more than most things you need to cook and eat. The internet worked on my laptop but not my new iphone( couldn't see the network) I rebooted both to no avail. Hi Karl - thank you for taking the time to provide us with this feedback from your stay. We are sorry to hear about the issues you encountered and we wish you would have allowed our local property team to address those issues during your stay. Our team has since worked to resolve these issues. Thank you! My husband and I go to mammoth several times a year and would not stay here again. 1. Email direction to parking garage was incorrect. 2. Only left one fire disc for us to start a fire, left us huge logs without any ax. We were staying 2 nights. 3. Parking garage driveway was not cleared of snow and we were unable to get our car out during normal hours. Only positive note to this place is that it was clean. Thank you for sharing your review with us. We do only provide one fire starter and one book of matches for each reservation. We have verified there is a spa key in the unit and that all information emailed to our guests is correct. We are very sorry to see you were so disappointed and hope you will give us another opportunity in the future. Thank you! Ideal property and location only a shame we were just there for 2 nights. Facilities in the apartment and the complex with a pool and spa area were all well kept and easy to access.